Concern over interactions between marine mammals and fishing operations in Australia’s major small pelagic fisheries have not only focussed public attention on the issue but have significant implications for their management and future development. Two case studies are discussed; an established purse seine fishery and a developing mid-water trawl fishery. 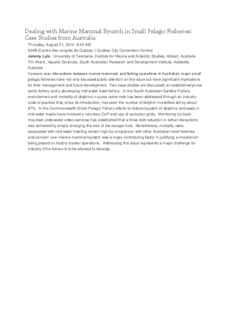 In the South Australian Sardine Fishery encirclement and mortality of dolphins in purse seine nets has been addressed through an industry code of practice that, since its introduction, has seen the number of dolphin mortalities fall by about 97%. In the Commonwealth Small Pelagic Fishery efforts to reduce bycatch of dolphins and seals in mid-water trawls have involved a voluntary CoP and use of exclusion grids. Monitoring by trawl-mounted underwater video cameras has established that a three-fold reduction in lethal interactions was achieved by simply enlarging the size of the escape hole. Nonetheless, mortality rates associated with mid-water trawling remain high by comparison with other Australian trawl fisheries and concern over marine mammal bycatch was a major contributing factor in justifying a moratorium being placed on factory trawler operations. Addressing this issue represents a major challenge for industry if the fishery is to be allowed to develop.